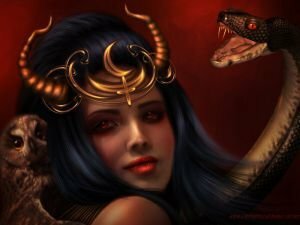 Who was Lilith and Why was She Left out of the Bible? According to the legends, Lilith reincarnated into the guise of the snake and tempted Eve from the Tree of Knowledge, to prove that even Adam's submissive wife was not perfect. Latest articles along with topics about Mythology. Read about stories, mysteries as well as useful advice when it comes to Mythology. Get the latest news along with articles on Mythology. In Zoroastrian mythology, Ahriman is an evil spirit, who according to one legend created all that is evil to oppose all of the good created by Ahura Mazda. He is expressed in human beings through greed, lust and envy. An inseparable part of Ancient Greek mythology are the Greek Muses. These are the 9 goddesses who embody the arts and inspire creativity with their grace through song, acting, literary gifts, music and dance. Hera is one of the most powerful and fair goddesses - she is thought to have no equal in ancient Greek mythology. Magnificent, in a long beautiful dress woven by Athena herself, she would descend from Olympus on a chariot drawn by 2 immortal horses. The foods you need to eat to cheat death are quite bizarre and varied - from ningyo meat (a creature that's a cross between a monkey and a crab, similar to a mermaid, from Japanese mythology), to ambrosia in Greek mythology. Which Mythological Villain are you Based on Zodiac Sign? Each of the zodiac signs has its cute little shortcomings, which correspond to a great extent to some mythological villains and dark powers. Gemini - Forest King. Cancer - Kikimora. Leo - The Cat Storyteller. The Leviathan is a biblical demon or monster of the form of a serpent, often symbolizing Satan. According to the legends, some of the first seafarers often encountered this sea creature. Conscious dreaming is the foundation of the Buddhist practice called Yoga, the state of dreaming, which is known and dates back at least a thousand years ago. Gorgons are one of the most hideous and bloodthirsty creatures in Greek mythology. Euryale, Gorgon and Medusa were possessed bodies, instead of having hair on their heads had nests with snakes. Greek Mythology: Alexander the Great is one of the most extraordinary and famous people of all time. He was deeply influenced by his mother Olympias, Aristotle and the greek god Dionysus. Babylon is one of the ancient cities in the world. Rise and fall of Babylon. Cyrus the Great conquered the ancient city of Babylon. Why Do We Call Mars the Red Planet?